Since Christmas is a time for families, and since my sister and my niece were not with us this year, my mother and I made a slightly late-in-the day, slightly haphazard and snap decision to go to Paris for 5 days, setting off the morning after Stephen’s Day. I am not going to pretend it was the easiest holiday of my life, the crowds were crazy, the queues mad, the weather mixed, navigation difficult, and the city, as always, is on the expensive side. It is the most visited city in the world by tourists i believe, and this Christmas/New Year break sees a huge spike in visitor numbers. There are, there were, quite literally, millions of extra people everywhere cloggging up the city. Inching forward slowly along the queues at major sights -as the M. D’Orsay, or Sainte Chapel say – can be tedious, up to an hour in the cold. True, you can pre-book some of the blockbuster sights like the Louvre and the D’orsay. But of course, even when you do get inside, you stiill have to deal with the same fellow-tourists, milling around inside, blocking your view of everything. But. of course, one thing you do always get with Paris; well, you get to see lots of very old, interesting and beautiful things. Here are a few for you to enjoy. This, undoubtedly, was the wonderful the Musée Cluny, also called the Musée du Moyen Age. (meaning the Museum of the Middles Ages of course). It is located, aptly enough, in a very splendid, indeed spectacular medieval Religious House, specifically in the former Paris headquarters of the wealthy, powerful, and highly influential Benedictine Order, one of the defining institutions of medieval Europe. The museum (which I’ll call M de Cluny for short) is interesting therefore, because as you walk around the wonderful exhibits of medieval, Romanesque & Gothic artifacts, collected over many many decades from all around France, you do so in the frame and space of medevel architecture. Or, in other words, the building is as much of a star as the collection. above: Flamboyant. 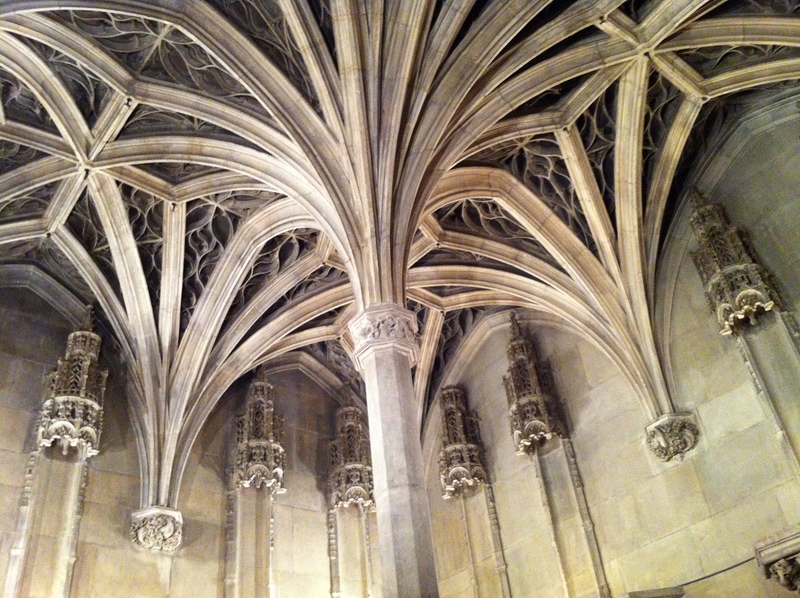 High Gothic vaunted ceiling. M. de Cluny. France has the best medieval heritage in Europe, which means the M. de Cluny is probably the best museum of its kind, its period, in the world. France of course, was the first consolidated Nation states in Europe, with an extremely powerful, centralsed monarchy, rich farming and trade, a wealthy aristocracy and even wealthier and more powerful church institutions. All this wealthy patronage therefore allowed early medievel France to rapidly develop a scholastic, intellectual and artistic culture fully commensurate with its status as the preeminent Europe nation. The evidence is everywhere you look. 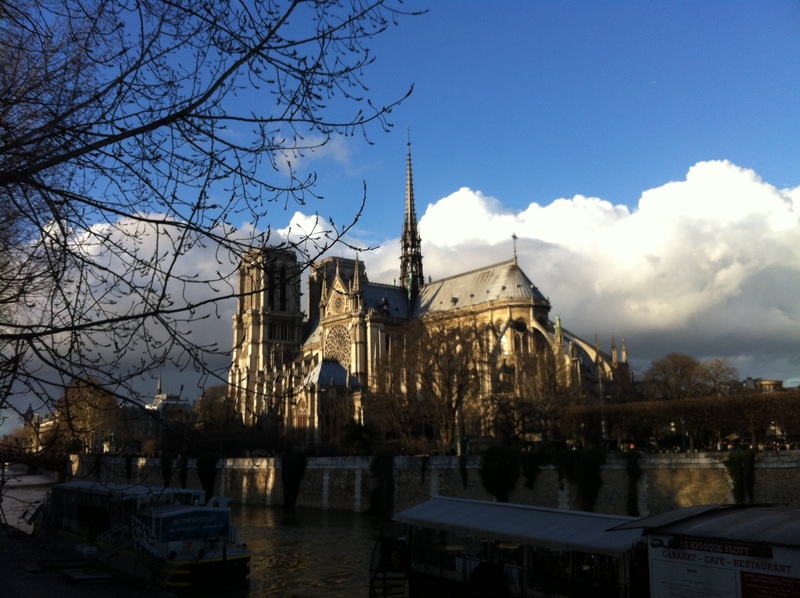 Talk a walk around the old heart of Paris, into the cathedral or any of the older central churches, and one sees an extraordinary, stunning, level of sculpture, painting, architecture and decorative arts. Time and time again in the museum, and indeed throughout our Paris trip, I was struck by just how dam good everything was. 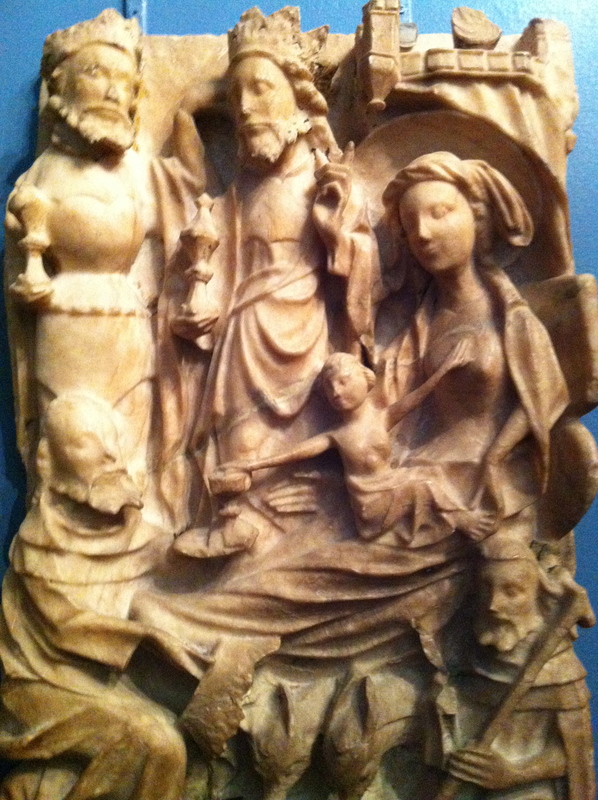 Madonna, Child and Saints in relief, alabaster. M. de Cluny. 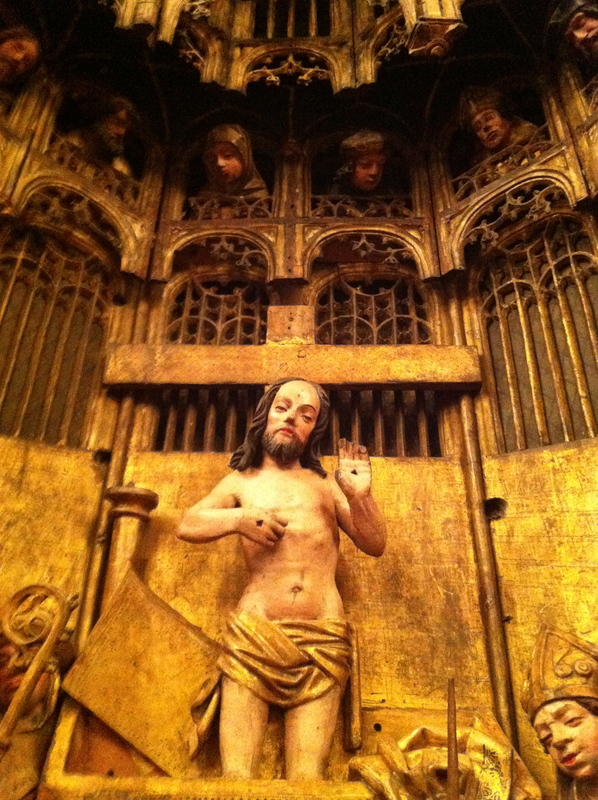 Christ in Majesty; wood panel, later piece. M. de Cluny. Above: another panel from the same altar piece. In both the two pictures above, the little wooden figures are much smaller than they may appear here, barely the height of a man’s hand. So the level of skill to carve and paint them so finely was, well pretty dazzling I thought. I was struck by the “modernity” of these lines, above. 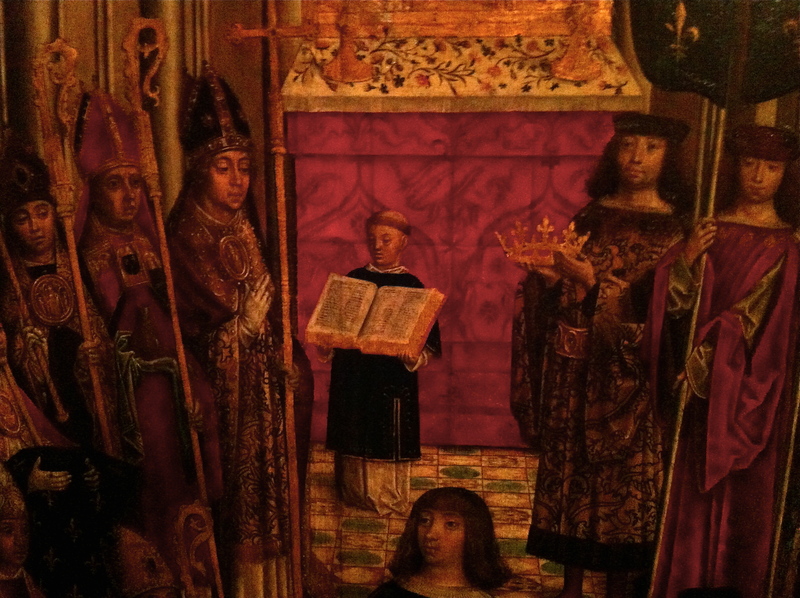 Above: French kings were powerful enough, pious enough, and had enough clout, that several were canonized soon after their death. 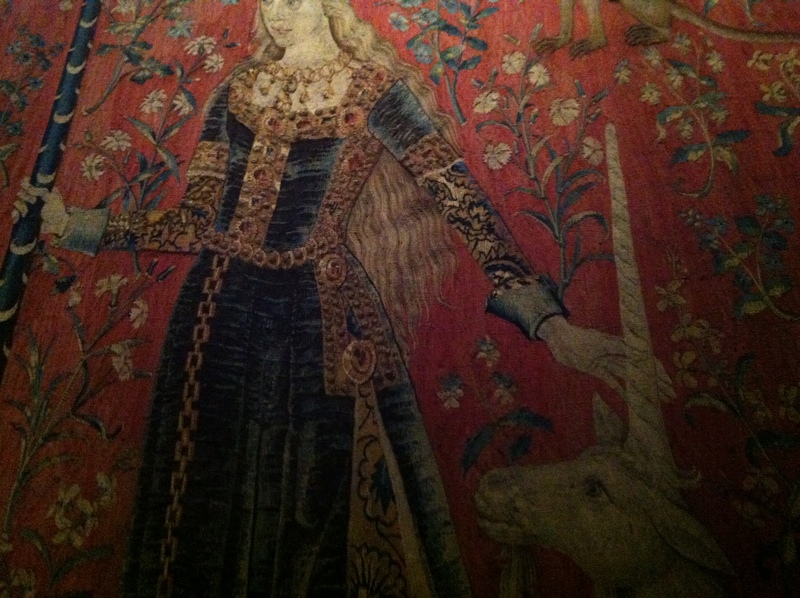 above: My lousy picture of perhaps the most famous highlight of the M de Cluny, the lovely series of Tapestries called Lady and the Unicorn. (the light in this gallery is kept low to protect the precious fabric) This is a lovely, complex, enigmatic work of medieval allegory, its symbolism most likely concerns ideas about earthly senses, verus our spiritual side and our notion of heaven and the sublime. I studied art history and still teach it as a subject to secondary students. Like most Art History undergraduates, a lot of our course was concerned with Greek and Roman art, early, then mid, then late Italian Renaissance art (from Venice to Florence to Rome and Naples) and with Northern European art, (German, N. French, Dutch and Flemish) of the same 200-year period. I recall we also studied in excellent detail, Spanish Art, French Impressionist and Post-Impressionist Art, early Modernism, (in both art and architecture, everything from Bauhaus to Mark Rothko) and 19th century art and applied arts, especially French, German and British. That was a very good course, and my tutors and lecturers were all excellent. (My personal tutor C. Robertson, had a hand advising on the restoration of the Sistine Chapel and another lecturer was editor of the definitive C.L.B.R series (on the Flemish giant Peter Paul. Rubens.) In other words, it was a very good Art History department at Oxford Brooks. I was lucky enough to receive a very good grounding in Art History, that most rewarding of subjects. However- and this is nobody’s fault but my own- I don’t recall studying much medieval art. Hardly any in fact. I barely knew what i was missing. Whether I studied it or not however, I did build up the lazy idea that medieval European culture was essentially bound up with religion. In other words, dominated by the church and their stranglehold on learning and ideas, a “God-bounded era, an anti-science, anti-human, age, utterly preoccupied with faith, and mystery and devotion. The idea that man was weak and insignificant, life on this earth was short and squalid and that man’s conduct on this sin-infested planet should be mainly occupied with prayer to help gain access to the far more important, and much longer (okay, infinite) afterlife, in heaven, a paradise, united with our savior. Then, (the received narrative goes..) in the Renaissance, classical knowledge was rediscovered, revived and further developed, while new humanist philosophy placed man centre stage. This new philosophy was played out and reflected in poetry, literature, music, science and- perhaps most spectacularly in architecture and the visual arts. Our new (scientific) understanding of vision and of optics, for example, was reflected in most mathematical perspective in painting (Paulo Ucello et al) or in painters’ use of atmospheric perspective (de Vinci etc) Likewise, our new (scientific) understanding of the human body, for example, was reflected in better (artistic) depictions of that body, better anatomy, more realistic, more dynamic figures, think of contraposto, meaning of course the shifting turning weight of the human body in movement and in action. All of this was Progress, a triumph of sorts, a triumph of the spirit and the ingenuity of man. Does all this sound very familiar? Thought so. 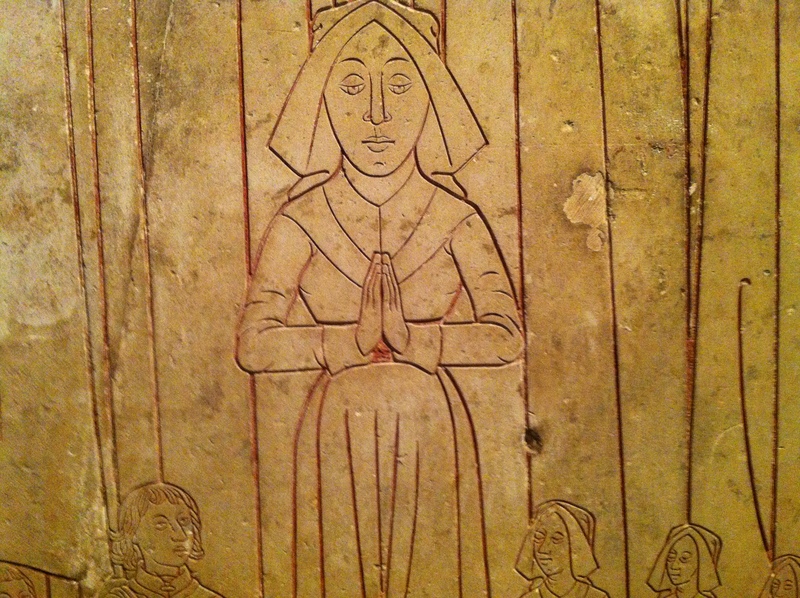 Here is a fairly “typical’ piece of medieval sculpture. Shallow “bas” carved relief, on marble, limestone, alabaster or whatever it was. As you see, it depicts a man and a woman, perhaps they are courting, perhaps they are already man and wife. 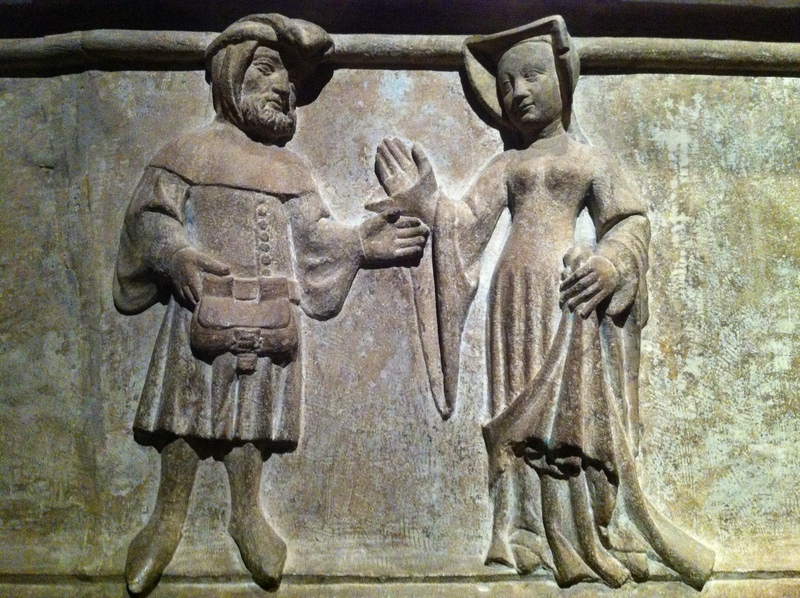 This may have been from a sarcophagus, in which case they would certainly be man and wife, but I don’t think it was. Either way, the piece has that distinctive, unmistakable loveliness we we associate with medieval art, not clumsy exactly, the carving in fact is very skillful and accomplished, yet nonetheless the medieval sculptor does not have the same skills, knowledge and techniques that Renaissance sculptors will exhibit 300 years later. True, her face is lovely, ineffably sweet, but although she is slim and gracious, look at the way the figures are rooted to the ground, slightly stiff, how they lack dynamism and movement. Even the folds of drapery are stiff, none of the cascading, free-flowing virtuosity of later, Renaissance art. In short, a lovely, lively yet highly characteristic piece of medieval sculpture. It is actually very good. It puts me in mind of Giotto. Solid but never stolid, with its keen observation of individuals, of relationships, of presence and of gesture. 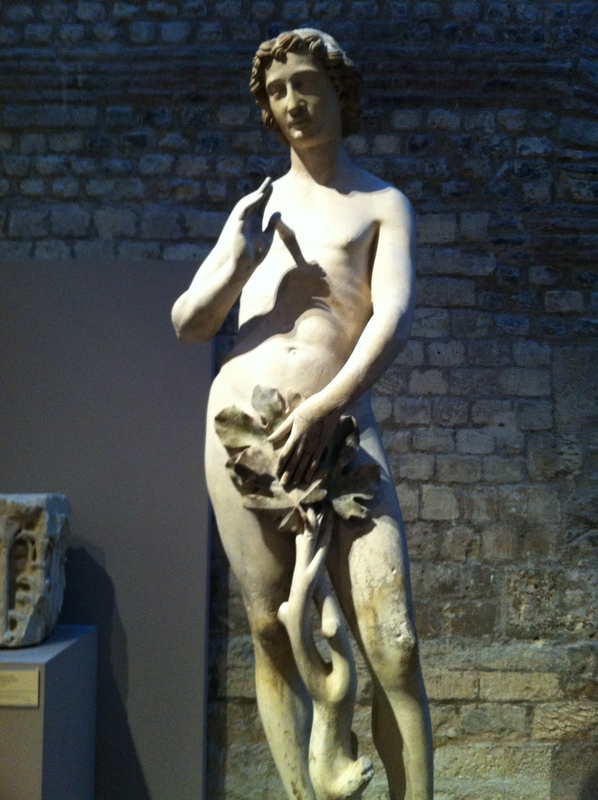 Look at this- Because, believe it or not, this sculpture/statue, of Adam was made in or very near to the year 1260. Yep, around 1260… in medieval Paris. I know, amazing. This piece of sculpture dates from exactly the same period as the man and the woman. It is not that it is “better” in any way. But it is most certainly very, very different. Because you’ll see straightaway that this single piece of sculpture refutes, contradicts and essentially disproves everything i said earlier about medieval, versus Renaissance, knowledge: of classical art, of anatomy, of technique. It also contradicts and essentially disproves everything I said earlier about medieval, versus Renaissance philosophy, culture, understanding, world-view and sensibility. Finally, (as if all that were not enough) look at the pose, the way most of the weight is shifted onto one foot, the way the body is clearly hinged and bending at the waist, (very different from the slightly stiff, upright statues of general medieval sculpture) and the way the torso gently twists on the vertical axis. So, if, like me, you were brought up with that traditional view of the development of art history outlined above, this statue is, to say the least, a bit of an eye-opener. It appears well “before its time” to put it mildly. As I said at the top of this piece, I still feel we should all avoid Paris at peak times, Xmas, Easter, and in the summer peak season, mid-June to early September. But if we can’t do that, perhaps simply avoid “the big 5” and stick instead to the less-visited wonders of the City of Lights. Having said all that, the city remains beautiful, and full of wondrous things. Truely, it seems, we’ll always have Paris. 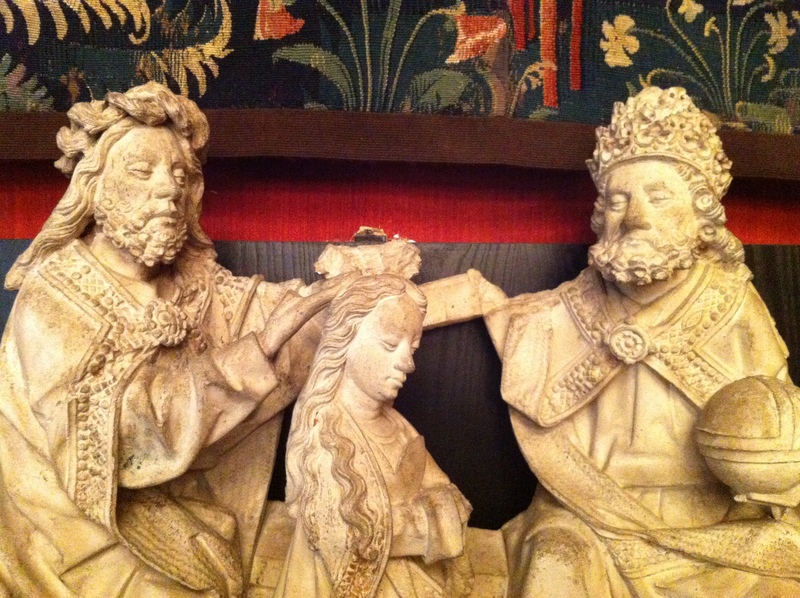 Next time you go, make sure to vist the lovely Musée de Cluny. If you like the post above, please leave a comment. January 3, 2013 April 14, 2013 Arran HendersonChurch Architecture, France, History, Travel Writing., UncategorizedArchitecture, Church Architecture, Design, France, French Gothic, French Romanesque., Paris Gothic, Paris Romanesque., Photography, Travel Writing. 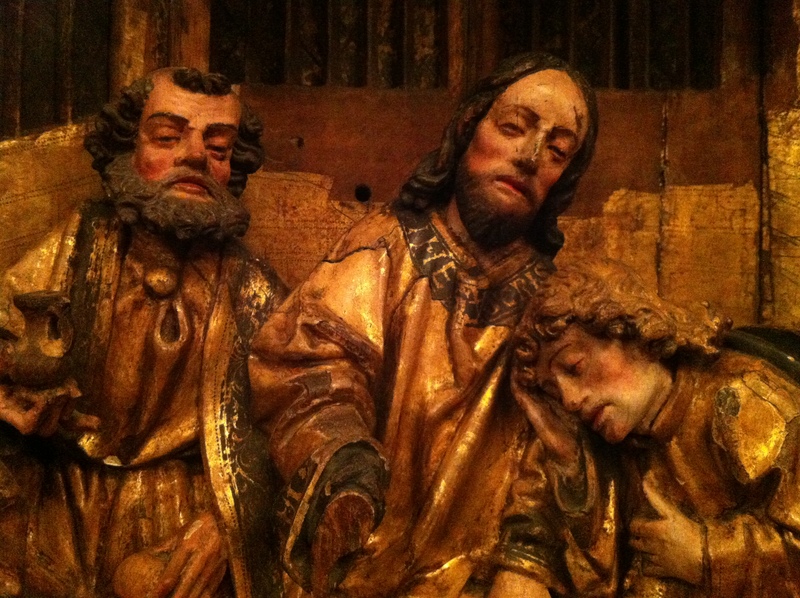 A delightful wood-carved statue of Saint Mary Magdalene from Brussels is my favorite museum item in Cluny. Thank you for your response WM, always a pleasure to have you visit. I don’t have a clear recollection of that Saint Mary Magdalene from Brussels you mention, (there are so many wonderful artifacts in this museum of course it’s impossible to adequately regard them all) so I am trying to google an image. Not having much luck, alas! But thank you for reading, always a pleasure as i say. Lovely Arran! Sounds like the trip was worth it. Wow, that was rather interesting, informative and entertaining at the same time! Thank you Arran! I already spent some time in Paris and visited the museum, too. Reading your description of Paris during the Christmas season tells me that I definitely always will have to choose another time ^^. I particularly liked the statue about which you said it’s a bit of an eye-opener. It’s amazing and fascinating to see the difference! Enjoyed it again very much to visit your blog! Till next time and Happy New Year! Gosh, what a nice response, thank you for your visit and for your kind words. Yes, I agree, although Paris is always full of wonderful things, it is difficult to really enjoy them, or the city itself, when it is so extremely crowded, and personally, although I’ve been lucky enough to visit Paris many times- I’ve never seen so many people there. It was like the Tokyo underground at rush hour at times! But I am delighted you enjoyed the piece, and thank you agan for your generous words. Hope 2013 is a great year for you. best regards- Arran. Great post and observations Arran! You’re right about the prevailing art historical story which needs to belittle Medieval art to heighten the brilliance of the Renaissance. (As it the Italians need it!) Even the name “Medieval Art” is often used as a blanket term to describe the late Roman, Carolingian, Romanesque and Gothic periods which I think are each very unique, nuanced and beautiful movements. I’ll have to get back to Paris soon. The M de Cluny was closed for renovations last time I was in there. Sorry to hear about the crowds and queues, but it sounds like you had a good time anyway! absolutely, Christina, very well put. When I was younger I was probably dazzled, like everyone else, by the renaissance masters, possibly to the detriment of other eras, but as I get older I find the work of the previous older centuries appeals more and more now. Although I still know so very little of this period, or periods as you rightly say- I’m really looking forward to learning more year by year. Incidentally, have you come across the great Dennis Aubrey yet? He and PJ blog on WP, on Romanesque architecture and sculpture. ( he is the writer; she the photographer) Their posts are superb I think, certainly a model for a lightweight like me, learned, subtle and sensitive. I’d paste a link here for you but haven’t learnt how to do that here yet (and there’s no search engine as such on WP alas) but a simple Google would also do the trick, under Dennis Aubrey or the name of their site, “Via Lucis”. Anyway, thank you very much for your visit and close reading, and the very kind comments, I hope you’ll come by again. -Arran. Thanks, I do follow their blogs already 🙂 Seeing the photos in “Via Lucis” is a daily treat! How wonderful of you to brave the holiday crowds and (spontaneously) set out for Paris…I had the pleasure of living in that enchanting (and sometimes maddening!) city for 6 months — the Cluny Museum is one of my favourites — thanks so much for posting your beautiful photos. Yes, the museum is an absolute corker alright. Really glad you enjoyed above, and very flattered that- as a former Paris resident- you read my humble tourist piece at all! Thank you for the kind words. 🙂 Arran. Great Post Arran. I like the fact that your insight into medieval and Renaissance art comes from first hand observation which you demonstrate with example. I think you are entirely right. Your idea ties in with the misnomer, Dark Ages, an invention of Petrarch (14th Century) to emphasise the grandeur of the emerging Renaissance culture as opposed to what went before. It is an artificial and inaccurate term and, I believe, discarded by most historians today. I am not a historian, art or otherwise, but in my readings on the medieval period, I am struck by how vigorously creative the so called Dark Ages were. I think a close study of visual art is really important when attempting to understand the medieval world, which is why your observations, Arran, are so interesting. Many thanks Dermot for your generous comments, and interested to read what you said regardijng Petrarch, I had no idea he was the originator of the term Dark Ages, which, as you righty point out is both an absurd misnomer and indeed now a widely discredited one also. I agree entirely with your observations on how creative the whole huge era was. On that note, did you catch any of Waldamar Janusczazck’s bloke-y but generally excellent “The Dark Ages- an Age of Light” ? (not hard to guess the revisionist tone, just from the title.) I thought he cheated a bit, including a lot of wonderful Islamic and Byzantine art which was from the period, but which no critic or historian ever would have called “from the Dark Ages”. Nonetheless, it was a very good series, and an important corrective, as part of a long overdue assessment. Thanks again for your visit and hope this is a very good year for you. -Arran. thanks a lot for your great blog! Really a beautiful presentation of medieval and Renaissance art. Great! And thanks for your comment on my blog quite a while ago about writing in German and the problem with the translating programme. Since autumn last year I publish fewer blogs but therefore bilingual. Actually I started blogging in English and German with a serie of medieval themes – illumiated manuscripts. And don`t worry, I didn`t see your comment as a critique of my blog in general – you are right it makes sense blogging in English as well. Thanks for your hint. dear Klausbernd, , I am really pleased and delighted you enjoyed the little piece on Art just above, thanks very much for your generous words about it, and the blog in general, that’s very kind. I’m also delighted you’ve started blogging in English as well as German too, now I can visit your blog and read and understand it all. Really looking forward to doing that soon. That’s it for now, but great to see you again. Best regards – Arran. Lovely post, Arran. I lived in Paris for fourteen years but you probably saw as much museum art in your five day visit as ever I did! Cluny is a beautiful setting, only thing I’d say is that fifteen years ago the crowds weren’t anywhere near what they are today. many thanks Jane for such kind comments. Museum art or not, I’m quite jealous you lived in Paris for 14 years, what a fabulous place to live. I entirely agree with you about the ever-worsening about the crowds however, I’ve been fortunate enough to visit Paris many times over the last 20 years or so, although until this xmas, my last previous 3 visits, oddly enough, were all in 2005.. I still have clear memories of my first two “grown-up” visits, the first Inter-railing with my 2 best friends, straight after school, the next was an art history field trip in second year of college. Paris was certainly nothing like as crowded then, nor quite as astronomically over-priced. (the same is true of Barcelona then compared to now, where i was lucky enough to live at a terrific, very unspoiled time) . Those two things, prices and crowds, somewhat tempered my enjoyment this Paris trip, although it is and will always remain a wonderfully beautiful city. I seem to have started visiting France more again these days, was sailing around Brittany in August. There is much more to explore. But I think I shall stick to the provinces for the next while ! Previous Post Post 5- Confederates and Cromwell.